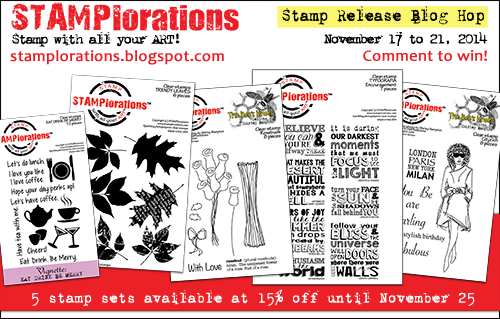 Welcome to Day 4 of the November Stamp Release Blog Hop here at STAMPlorations! For complete info on our hop, including how you can win stamps, click here. Today, we're putting the spotlight on CityGirl, another stamp set designed by me. We'll be picking one commenter to win this set so leave a comment here and on the rest of the STAMPlorations girls' posts for a chance to win the set. I stamped my CityGirl on white card, sloshed Distress Inks on her coat, then masked the image and used the snowflake block from Vignette: Christmas Block to create the floral burst around her, stamped the sentiment, chopped up so that I could substitute 'fabulous' for 'stylish' (but she's both! ), then smudged black Gelato around the outline and mounted the white panel onto red card. Once again I am blown away with how creative my teamies have been with this set! You girls rock! The background and colors along with the shadowing makes this card look so cool..
That's such an amazing 'sloshy' image, Shirley ... vibrant, bold and so very stylish! And the texture you added around her is fabulous!!! I just got this set in the mail last night and had to bust into it right away. I am going to wear this girl out because I'm loving EVERYTHING about her. Thanks for creating such a great set! Great design, Shirley! 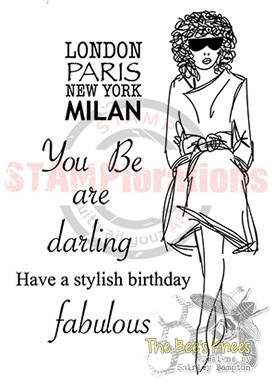 I agree, the gals havereally made some fabulous cards with your stamp set! the colours are brill. Love your background. Classy, bright, lovely!! The more often I see that trendy coat, the more I want one...in every colour imaginable! Fabulous showcase! Great card - love that mysterious looking lady. Fabulous! Love the splash of colors in the background and the lightly stamped cities! The background is fabulous as is the shadow effect behind the image! Great work! What a wonderful background and the colours are gorgeous! Love the shading you've done to make your girl pop! Oh this card turned out so good! I love the stamped circle of colored goodness you surrounded her in! Time well spent! You reign supreme in the 'sloshing world! The background is gorgeous! Just love her in that watercolor trench. What fun this hop was, eh? I always take few second on this blog hop before I have a look at the card (no reading first) and they ALWAYS surprise me nicely. ALWAYS. Just amazing. Love the pops of color in the background to match her dress.